As I build up my repertoire here, I’d like to feature more recipes with similar ingredients, or weekly menu suggestions as a colleague suggested once. It’ll be easier when I’m more than a year old (!). I’ve mentioned before that I often make a big batch of something at the beginning of the week and then eat it for lunch the rest of the week. This works well for time, but one does get tired of a single dish forever. One of my coworkers was complaining of a similar quandary today, and we may start doing Wednesday office lunch trading, which I think is rather a marvelous idea! Basically, trading lunch on Wednesday, when we’re sick of Day 3 of the same thing. We’ll have to restrict membership to the people who actually cook though. I’ll let you know if it comes to fruition. Not that I would actually want to share this if I brought it to the office with me. Food-related shareables (I hope you like these)! Americans seem to be getting better eating habits (yay). But mostly we are trying to solve our cultivation problems with the typical solution, tech (tip: for articles you can’t read completely, sometimes googling the title then clicking on the link helps). I am excited about the possibilities but remain skeptical. What about using drones to plant trees? Actually, that sounds pretty neat. I do love trees, and somehow the mission seems more conscientious. So, recipe. This was inspired by giant shells in the pasta section of the co-op a short while ago. I’d been thinking about ravioli but I don’t have a pasta machine (yet), which makes ravioli construction much more difficult; giant shells are a worthy substitute. Evidently, I also had ricotta and spinach, which makes a lovely filling (as has been discussed), and continue to have winter squash to use. I’d been dreaming about squash pasta sauce, perused a few recipes (this one is quite similar, and also has links to more seasonal recipes), and determined that really you don’t need much more than puréed squash to make a good sauce. Turns out it’s true; this dish is pretty spectacular—definitely dinner party material (and secretly easily made in fairly large quantities). Make sure to get some garnish materials if you want to make it look fancy—little accents make all the difference. Roast the squash first: cut in half, scoop out the seeds, and put in the oven in a pan with some oil or butter under high heat for a long while (50 minutes?) until soft. Chop and roast the onions on the side of the pan. Boil and salt water and cook the shells until al dente, slightly firm still but soft. Reserve some of the pasta water! This is to make the sauce: Purée the squash meat with onions, pasta water, and a little stock or cream if you like (yogurt would also work, which is what I generally keep around). Add a little rosemary or sage and season as you see fit. For the filling (can be assembled as pasta is cooking if you like): Sauté the garlic in oil until slightly soft. Add spinach until wilted and most of the moisture is gone. 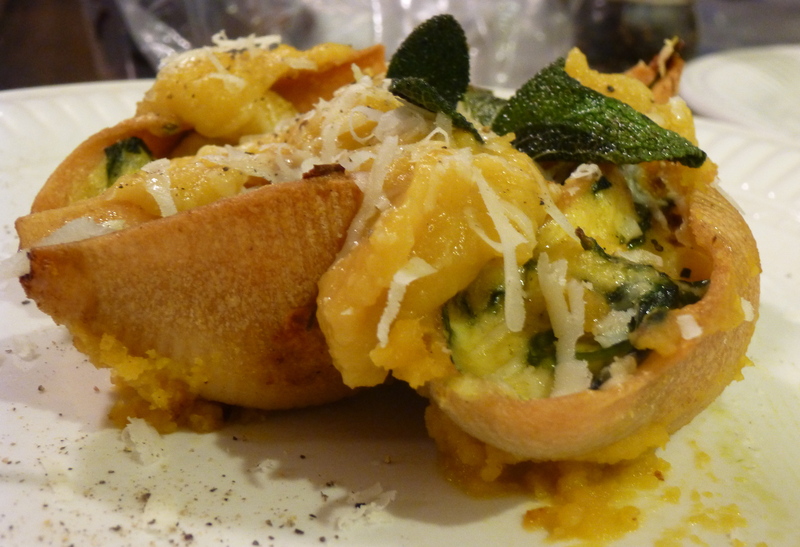 In a bowl, mix ricotta, egg, most of the parmesan (reserve some to put on top), then squeezed (moisture-free) spinach/garlic. Preheat oven to 350ºF. Put squash sauce in the bottom of a pan (about 3/4 inch), then stuff each pasta shell with a little filling and tuck them in the sauce. Top with remaining parmesan, and bake for 30-40 minutes. It may benefit from covering with foil in the first part, so it doesn’t get dried out—then uncover and let the cheese on top become golden. Garnish: heat oil in a pan, and when hot add sage leaves. Fry, flipping once, until lightly crispy. Place shells on plate, add a little extra sauce if necessary, and place fried sage leaves on top. Sprinkle with a little more fresh parmesan and some fresh ground pepper. I mentioned at the beginning that I will soon be moving (in about a month)! But worry not, I shall remain in midcoast Maine and will continue to get a CSA and be cooking just as much. Maybe more, since I’ll have a roommate to cook for/with! And some more kitchen gadgets. If I start cooking more frequently for two or more people, some things may begin to change on this blog, as it has heretofore been largely an exploration of single-person cooking (although admittedly fairly often with guests to help cook or at least taste). However, I don’t envision it transforming significantly. You may notice some new backgrounds in my pictures though! Spring has sprung, dear readers! There is fresh spinach at the market and smiles abound! About damn time, that’s what I think. Yesterday it got up to a glorious 50, almost 60 (!) degrees. Fabulous. I took a long walk and everyone seemed so happy, smiling, saying hello—we’re emerging from our winter shells and it feels so good. I love living in a small town where you pass people on the street and wave, knowing that they understand what we’ve all been through. That all being said it’s supposed to rain and maybe even snow again today. Shoot. What that means is that although yesterday was a great salad day, you may want to use that new spinach for something a little warmer and richer. Fortuitously, I happen to have a recipe in mind for you. Spinach and ricotta are a lovely combination to fill just about anything. Here, they are combined with a few spices to make little dumplings (the recipe I took this from called them gnocchi, although I’m not entirely convinced that’s accurate, I really think of gnocchi as containing potatoes). Then you broil them, and they get all crispy and beautiful. A little crispy ball with a delightfully creamy inside. Need an appetizer for and Easter meal? Look no further (plus, it’s good for brunch or dinner). Do you use all the food that you buy? Food waste has the highlight of a few recent news stories. Modern Farmer discusses companies that are working to use leftover products from certain industries, like grape seeds and skins. And you may have heard about Dan Barber’s popup restaurant in New York, Wasted? Making gleaning trendy (I admit that part of me sighed “oh, New York,” when I read about it. But I approve). Another thing I wanted to mention is that this is a vegetarian recipe, like most of the ones that I cook and share with you. The reasons I’m a part-time vegetarian are because it’s better for the planet—veggies take less energy to grow—and that finding good, healthy (antibiotic free and all that) meat is rather pricey. But I do love meat and eat it not infrequently; and I think that meat animals are an essential part of a whole farm ecosystem. There are also ways to kill animals that aren’t too stressful, if that’s your qualm. If you are vegetarian, kudos to you and more people in the world should move in that direction—just keep in mind that plants are organisms too, and that just because we know less about them (and, for example, how they talk to each other) doesn’t mean we should feel more righteous about killing them as opposed to mammals. What I’m trying to say is that even if you have a strong ethical directive, you can’t stop thinking about where your food comes from and what it takes to produce it, and that goes for everyone. Original recipe from Food 52, although I actually found it too rich, so I’m cutting down the butter. Start by cooking the spinach. Wash, then sauté until wilted (it will shrink down a bunch). You’ll want to squeeze out whatever water you can, it is often very liquidy. After squeezing dry, chop it up. Melt 2 tablespoons of butter in the pan and add the spinach back in until all the liquid has disappeared, then add the ricotta and cook for a few minutes. 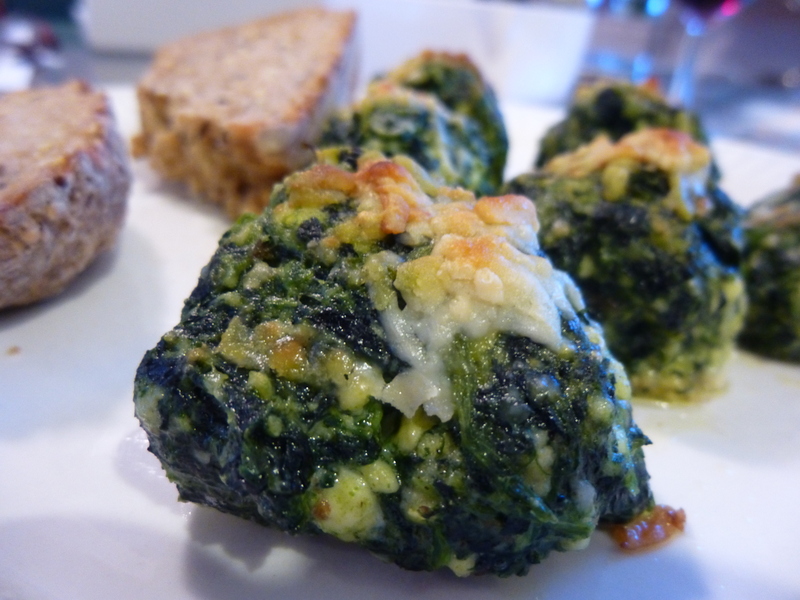 Beat the eggs together in a separate bowl, then add the spinach/ricotta, flour, 1/4 cup of grated cheese, and seasonings. Mix together, then refrigerate until a little firmer, 30-60 minutes. Boil water in a large (pasta) pot. Remove batter (dough? mixture?) from the fridge and shape into small balls, maybe 1 1/2 inches in diameter. Boil, like you would gnocchi, for 5-8 minutes, until they are all floating and get a little puffy. Lift them out and set them on a rack or clean tea towel to dry. Turn on the broiler (although you may have to turn the oven up really hot instead, depending on the strength of your boiler). Melt the last 2 tablespoons of butter in a small roasting pan, and place the dumplings in the pan, leaving a little space in between. Top with cheese, then broil (or roast) until the cheese is brown and crispy. Serve hot. They reheat well in a hot oven (you could put them straight from the fridge into a cold oven, then turn it up high). I recommend some crusty bread on the side.